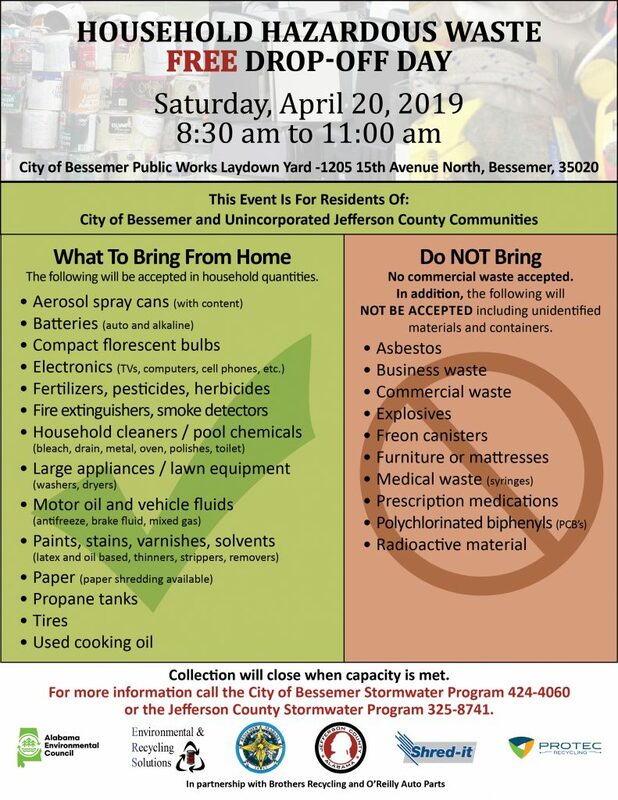 The city of Bessemer and Jefferson County will partner to host a free Household Hazardous Waste Drop-Off Day. The event is on Saturday, April 20, from 8:30 to 11 a.m. at the City of Bessemer’s Public Works Laydown yard at 1205 15th Avenue North. The event is open to residents of Bessemer and unincorporated communities in Jefferson County ONLY. Driver’s licenses will be checked. Other partners taking part in the event include the Alabama Environmental Council, Environmental and Recycling Solutions, Shred-It, Protec Recycling, Brothers Recycling and O’Reilly Auto Parts. Collection will close when capacity is met.